Since we moved into our 1930's detached home just over 2 years ago, it feels like we have had one endless battle with every day storage (or rather, lack of it) and clutter. When I say every day storage, I mean places to keep every day things within the house which you need to access. We have a huge loft and good sized single garage, which are great for long term storage or seasonal things, but no where for toys, books, clothes hanging space or other bots and pieces we didn't want out on display constantly. We recently made a list of all the areas in the house where we want to improve the storage (i.e. every room!) One of the rooms which we felt needed the most urgent action was LO's bedroom. His room contained a bed, chest of drawers and a little Lego table and chair. 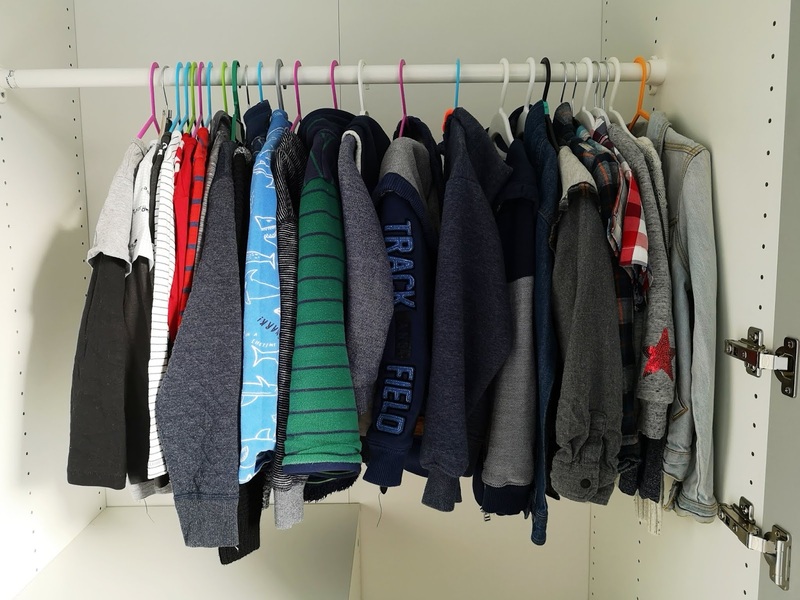 Clothes were either kept folded in the chest of drawers or hung in a toddler wardrobe in Little L's room. 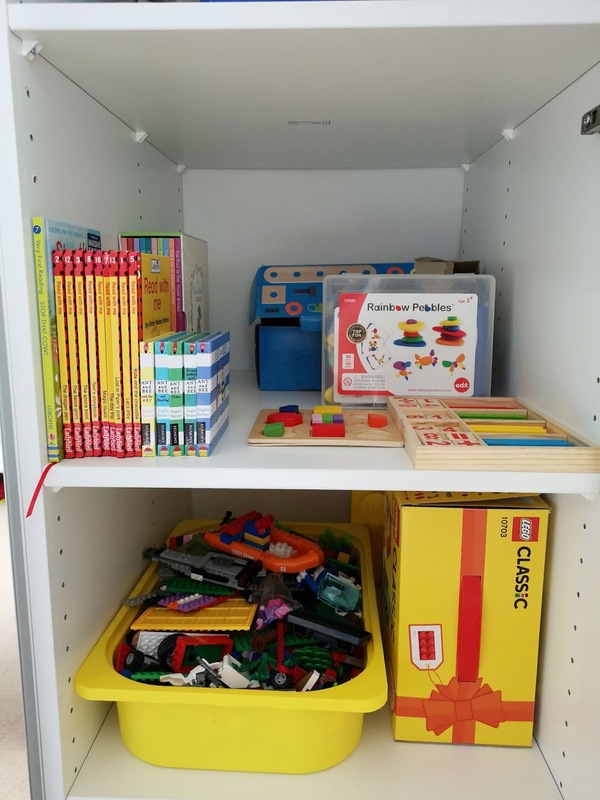 Everything else, from toys to his wooden train set, to books, Lego and any other random bits, were all stored in plastic storage boxes or those fabric toy bins around the perimeter of his room or under the bed. 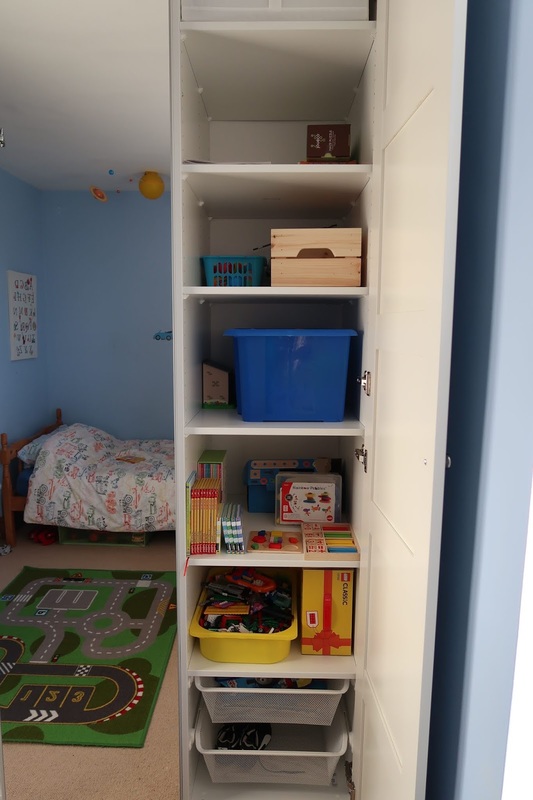 It looked cluttered and messy, was a nightmare to keep clean and tidy and we found that nothing really had a home, making it hard for him to find toys or to keep tidy. We pondered about whether to invest in getting bespoke built in cupboards, but with our budget being around the £400 mark, we knew we wouldn't be able to afford those. We knew we wanted a wardrobe with not only rails, but also drawers and shelves too. 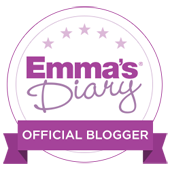 Having looked on various interiors and furniture websites including Very, Wayfair, Made.com, John Lewis and Argos, where we couldn't quite find what we wanted (most don't come with sets of shelves as well as drawers) we turned to our beloved Ikea. We have had lots of success with them before and having spotted the Pax Planner tool, we knew this would be the best way to customise the wardrobe we wanted for the best possible price. 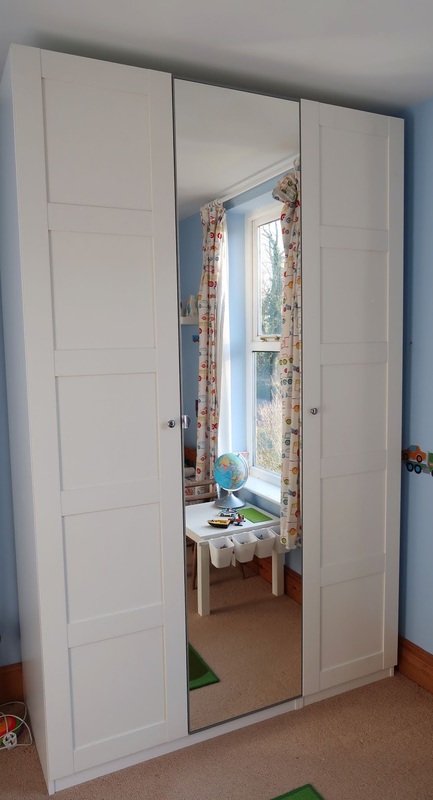 The Pax wardrobes comes in two different heights, and can be customised in lots of different ways to suit your storage needs and the size of your room. 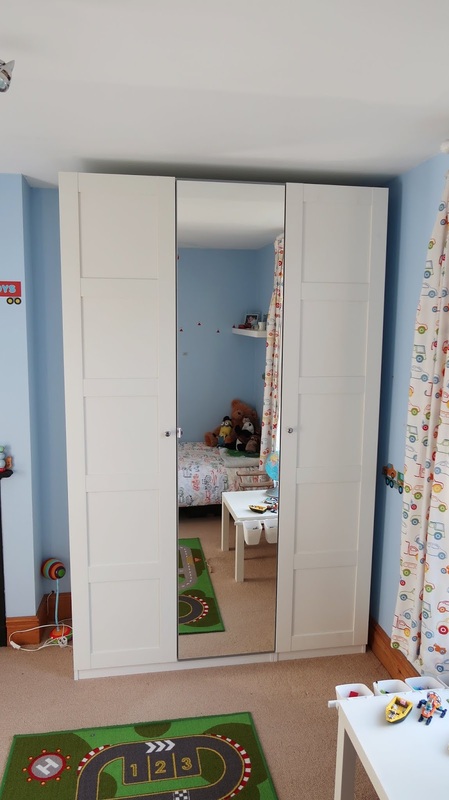 Once you have the frame of the wardrobe selected in the planner, you can then select from hinged or sliding doors, different styles of door front, colours, drawer systems, shelves and handles and knobs. We opted for the tallest Pax frame, hinged Bergsbo doors (panelled) as well as one Vikedal mirrored door. It total, the whole system, with all the accessories, came to just under £400 (with an additional £35 for home delivery). Of course, as it's Ikea, you do have to build the furniture yourself, but between Richard and I (I can't take much credit for the construction) we managed it over the course of an evening and the following morning. LO's bedroom is quite an awkward layout with a radiator taking up one who wall, a large window occupies the opposite wall, and so his bed neatly fits into an alcove, leaving one alcove free next to the fireplace for his wardrobe. 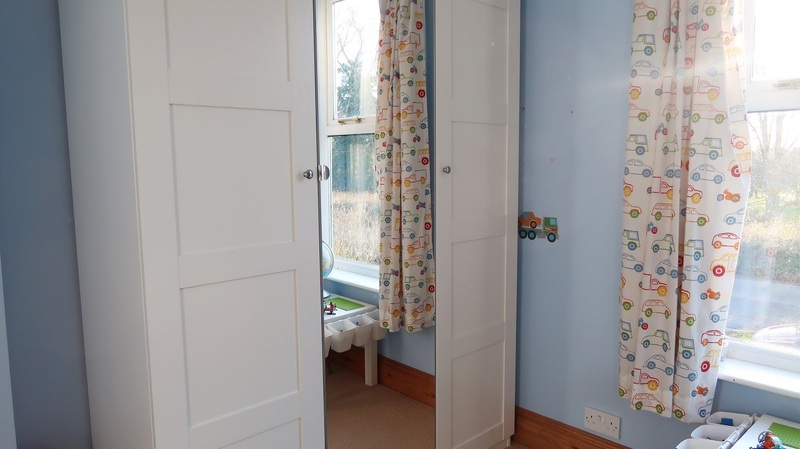 I was worried such a tall wardrobe would dominate a small bedroom, but the addition of the mirror bounces lots of light in from the window and the extra storage means the room is no longer cluttered, making it feel bigger and more spacious. Once it was finished, I couldn't wait to begin sorting LO's toys and clothes. 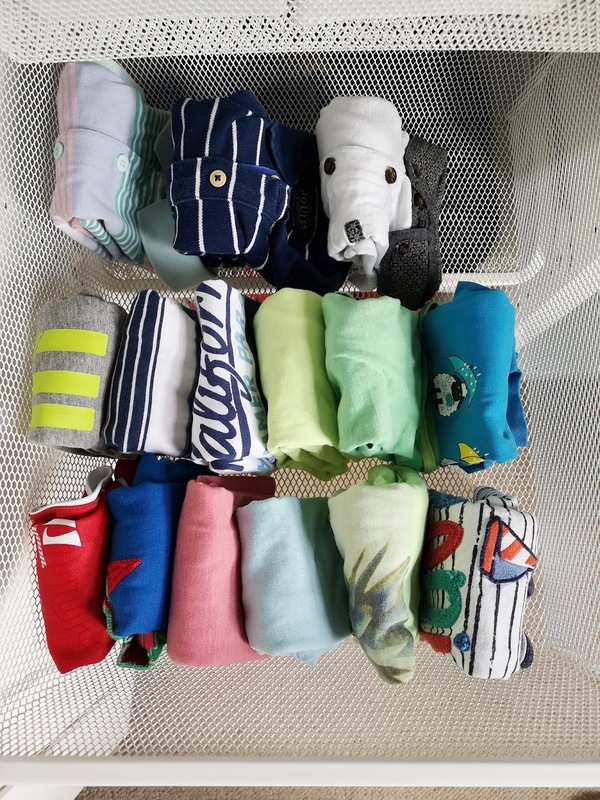 I'd already started on a Marie Kondo sort out with his clothes, so just needed to fold them neatly into little parcels into the drawers. We have been sorting toys too and started to organise the shelves with Lego, books and puzzles. I particularly love the metal mesh drawers, it looks so neat and tidy and has meant we can re-use his chest of drawers in the guest room; another room which is lacking in storage. 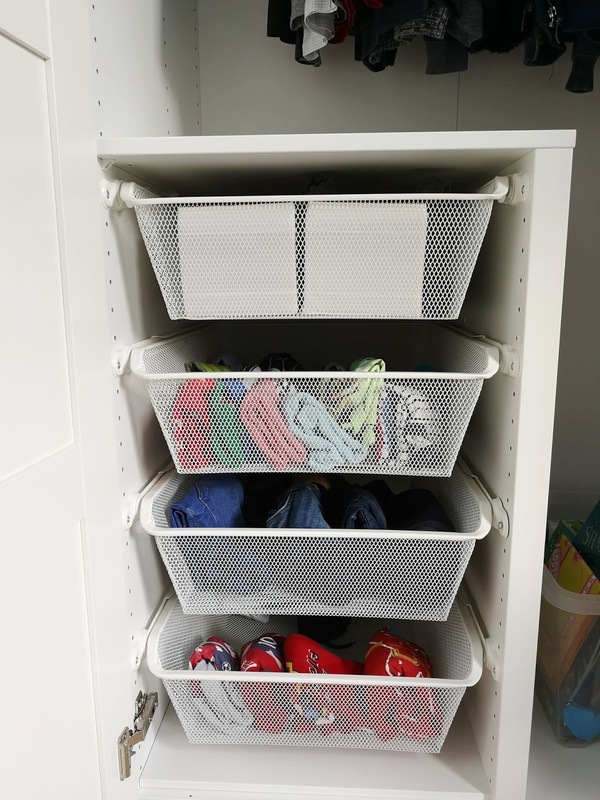 We have really maximised the space by opting for the tallest Pax units, and on the top shelf we have used Ikea Skubb fabric boxes for seasonal items, and storage for winter/summer wear. We are so pleased with how the wardrobe looks and how the storage works. It looks sleek and elegant and feels really sturdy. It's made such a huge difference to the feel of his room, and it's now so much easier to keep it tidy and organised. 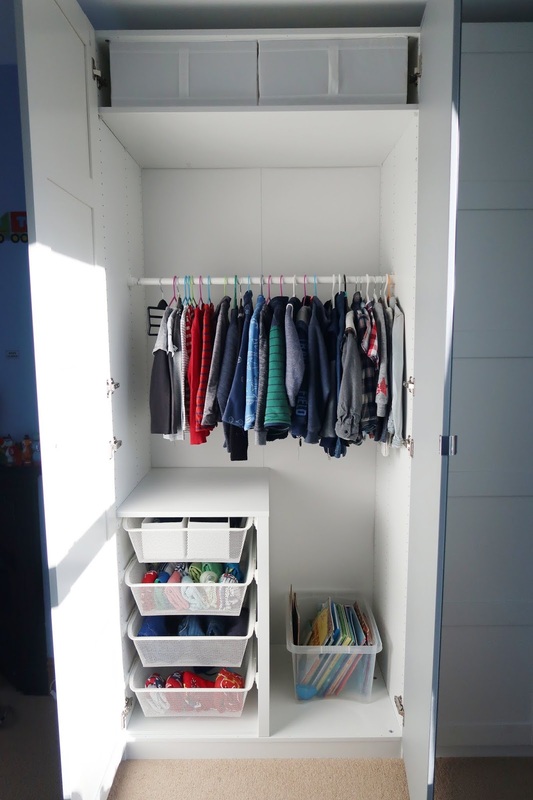 I've got the home organisation bug and I'm now on a mission to get the house de-cluttered and sorted...Our next project to save up for will be a similar Pax wardrobe system in the guest room. I really can't recommend the Pax wardrobe system highly enough.